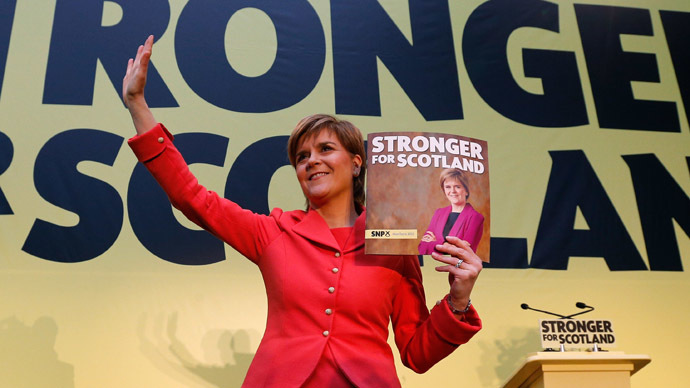 The Scottish National Party (SNP) outlined a series of policy alternatives to austerity, harsh welfare reforms and Britain’s foreign policies, as it unveiled its general election manifesto on Monday. Speaking in Edinburgh, SNP leader and Scottish First Minister Nicola Sturgeon framed the party as one for the whole UK in a pre-electoral bid to attract voters nationwide. A mere two and half weeks before polling day, Sturgeon laid out proposals for annual spending increases of 0.5 percent and committed the party to voting on issues concerning England such as National Health Service (NHS) investment. She also insisted that in the event of a hung parliament a “strong team” of SNP MPs could hold the balance of power in Westminster, and lobby for an increase in health spending throughout Britain. The party’s manifesto demanded new powers for UK energy regulator Ofgem that would empower it to force energy companies to pass reduced prices onto their customers. Sturgeon also backed Labour’s pledge to cut English university fees from £9,000 to £6,000 per year. On the subject of austerity, Sturgeon outlined plans to reverse £3 billion worth of cuts to disability benefits – a coalition policy path that has been condemned by human rights and social justice groups. The Scottish First Minister also told voters the party will officially recognize Palestine as a state in an effort to halt bloodshed in the Middle East. Other leading UK parties will likely scrutinize the manifesto for further details on the SNP’s plans to devolve full control over its finances to Scotland. Commenting on such a move, Scottish Liberal Democrat leader Willie Rennie said the SNP’s “hokey cokey” regarding its plans for absolute fiscal autonomy is a “diversionary tactic” created to distract prospective voters from allegations such a move would cost Scotland £7.6 billion. On the question of another Scottish independence referendum, Sturgeon said on Sunday she is not in a position to rule such an event out, as the decision ultimately rests with the people of Scotland. On Sunday, it emerged the SNP is making preparations to wage a post-electoral war with Labour by instructing her Westminster MPs to reject a minority government on austerity policies it dislikes. The party’s deputy leader, Stewart Hosie, told the BBC that in the absence of an official deal with Ed Miliband’s party post May 7, SNP MPs would hold the power to vote against legislation they oppose, including spending decisions. Hosie insisted the party’s MPs would not hesitate in rejecting spending plans they believe unwise – such as the renewal of Britain’s Trident nuclear deterrent. “If this was done on a vote-by-vote basis, then SNP MPs would be perfectly entitled to table any amendment they wanted or vote against any bit of legislation they wanted, absolutely,” he said. Both the Conservatives and Labour back the renewal of Trident. Analysts suggest the move will still likely occur even if the SNP, which could win as many as 50 House of Commons seats on May 7, voted to scrap it. If the SNP’s strategy was successful, however, Miliband would not hold the power to call a new election in a bid to win a majority. Rather, a Labour government would have to sacrifice a vote of confidence and wait for two weeks as other parties moved to create a new administration. This arrangement would pave the way for the SNP to reject significant dimensions of Labour’s legislative agenda, while maintaining it via confidence motions. “If the SNP vetoed defense spending for a year, our troops risk not being paid. Working people across our country will pay dearly for the economic chaos of Labour-SNP,” he added. Current polling indicates no single party will win an outright majority on May 7, and that the SNP could be Britain’s third largest party. Nevertheless, Labour has rejected the prospect of a coalition government with the SNP. Additionally, Labour leader Ed Miliband has failed to clarify whether an alternate arrangement, such as a vote-by-vote deal, could be orchestrated. Speaking directly to Scottish voters, she pledged to make Scots’ voices “heard more loudly and clearly” than ever before in Westminster. Addressing English voters, she vowed to build a new progressive politics across the UK born of common causes and newly formed alliances with other like-minded groups.